Again couple of months are gone since I wrote my last article. I think it’s time to write another article about the hot topic “Tamil fonts in Android OS”. I’m Android user since two years and I never thought to access Tamil websites or any Tamil content through my smartphone. 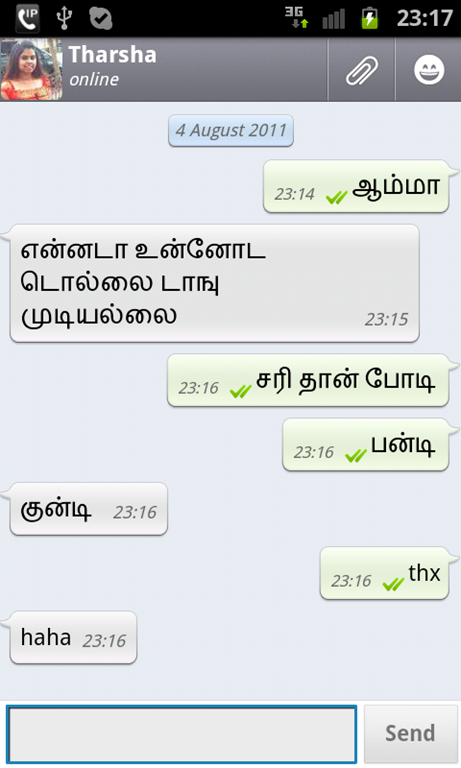 Since Tamil Unicode is not implemented in Android I also wasn’t that much interested in digging OS for Tamil fonts. One of my friends has IPhone and we had an argument which of the OS is best for current user. My argument was “it depends of the needs”. Android is open source and allows exploring more in your own way where IPhone OS (IOS) is exclusive to the users. Users are limited to certain functions. Anyway we leave the topic which of the Operating system is best; ) my friend said IPhone can read Unicode fonts where Android does not include all Unicode letters. I didn’t want to let my Samsung Galaxy s2 go down in comparison with his IPhone and I challenged him to make my phone able to read Tamil Unicode fonts. So it started with my research about Tamil Unicode Fonts. Tamil is a “classic“ south Indian language, more than 2000 years old (I’m not very sure). It contains (12*18) + (12+18) + 1 = 247 letters. I have searched in Google about Tamil fonts in Android and found millions of people are waiting for the Tamil Unicode implementation in Android. I definitely want to do something to be able to read Tamil on my phone. Not only because of my friends argument against Android also because of so many people who are interested in having Tamil Unicode fonts in their Android devices. After couple of research it was clear to me the Android phone has to be rooted to alter system wide files such as fonts and layouts. 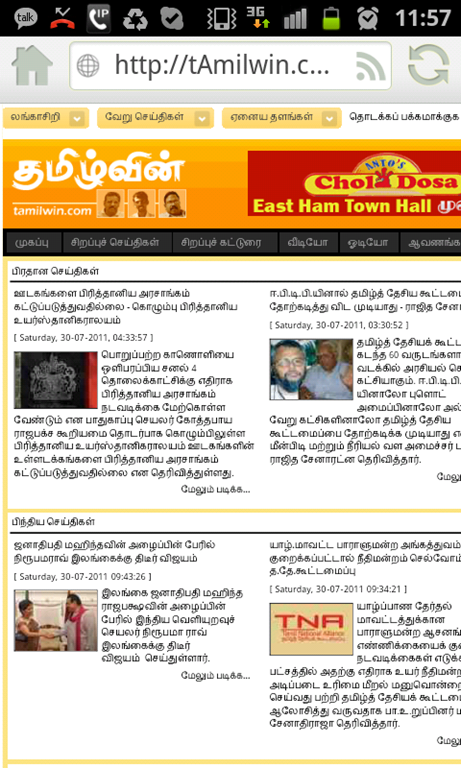 There are some methods in Opera Browser to activate bitmap fonts which is claimed to be able to read Unicode Tamil fonts. I didn’t want to go for that option because the solution is just to read a website and Tamil fonts cannot be accessed system wide. So I came to a conclusion to write a font which includes Tamil Unicode. This method would be perfect for any of the users who want to develop Application in Tamil without using graphic letters. Everyone should have it in order to render. 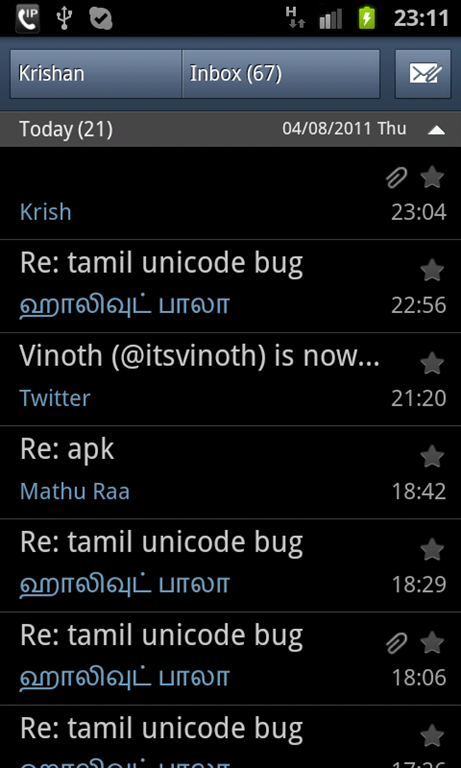 Everything in my plan seemed fine and I initiated the project writing Unicode Tamil Font for Android. Half a way through I have checked the Android market for any Tamil related application and found some Tamil keyboards which claimed to make it easy to write in Tamil. Obviously we don’t need to have 246 letters because some of the letters could be created by combining two alphabets. But still the letters are too much to place in the Keyboard. Furthermore we all are accustomed to write in English Keyboards. The Taminglish, art of writing Tamil using English letters has overtaken almost a full generation and nowadays it is common that young generation using Taminglish for their Tamil needs. Another idea has joined, developing a Taminglish Keyboard for Android which makes writing Tamil much easier than other options. In year 2007 (can’t remember) I have created a Script for MSN Messenger users who want to write Tamil Unicode in MSN Messenger. It was just a try and I didn’t have time to give further updates. Soon after launching the Script nearly 10 000 users have downloaded the script and I was happy to have such amount of fans. I though why don’t you give a system font along with Taminglish Keyboard which will instantly make it easier to learn and write Tamil. It’s been a week now since I have started the project. Today morning at 04:00 AM I finished the basic functions and tested the result. 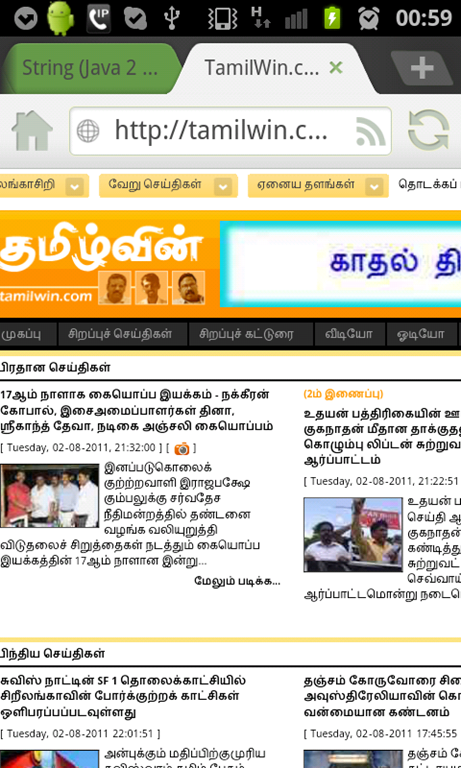 Now I’m able to read any Tamil Unicode website through any browser and I’m also able to send SMS/Text in Tamil. The Keyboard has not been correctly aligned, it is still under development. Keyboard functions are as usual with additional key [Cnv] which converts Taminglish into Tamil Unicode letters. For example: “ammaa” will be converted into அம்மா. I will be happy to have beta users to test the keyboard and font before I launch to the Android market. I also would like to get support/comments/suggestions/Donations to establish my project. Thank you all for your support and encourage I feel so much encouraged now. And BTW I’m sorry for lack of Tamil history knowledge ; ) I have learned much new things through this project. Overall I’m thinking to merge those two applications into one and hope will finish soon..
I’ll let you know guys. PS: the application might not response well please hit the button more than once, it will work, it is due to my bad coding to get superuser permission for the whole session. The partly rendering issue was already known to me. The intention of beta version was to make sure that implementing Unicode chars is working in first place. I purposely didn’t let the script to decode all chars as I thought it might overweight the standard chars. And I didn’t want any one break their devices. The donated version will alter the standard font and and implement all Tamil Unicode chars. from your reply for the beta version. I’m sure your device is fully compatible for the donated version. let your self surprise. as I said I was more concentrating not to break the phone it means the “NOT FULLY RENDERING” was already known to me while working with the font. and I have the answer that my script is working as I wanted. today or by tomorrow you all will receive update with fully compatible Tamil Unicode to the system. I feel so much encouraged now. Thanks for your support. I will take sick leave and try to finish it by today. Coding is not just a profession.. It's an Art.. Cool modern DialogBox for MS Access / VBA applications.